I've now returned home to Copenhagen after giving a keynote speech at the brilliant State of Design festival in Melbourne. It was fantastic to meet so many wonderful people but especially fantastic to meet some Cycle Chicistas who made the trip to Melbourne for the talk. 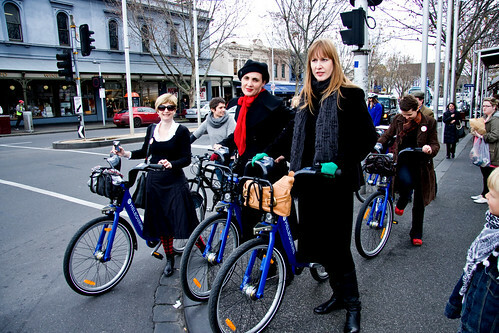 At left is Jenny - AKA Unity Finesmith - from Auckland Cycle Chic and, at right in the lovely green gloves, is Saskia from A Spirit of Place and Cycle Chic Sundays - Sydney. Here are some other chic cyclists enjoying the ride and the protest. 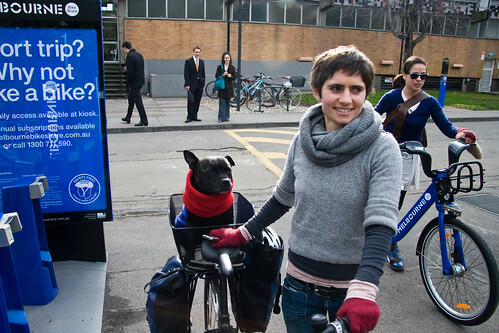 And a spot of Canine Demonstration Cycle Chic. His name is Bon Bon. All in all it was quite possibly the chic'est demonstration I've ever been involved in. I'd feel much safer without a helmet when we get Copenhagen bike lanes. Seriously, it's an important debate to be a part of and I'm so glad I was able to make it and bring some cycle chic love to Melbourne. When the helmet laws are repealed, you'll have to come back for a victory ride !!! Bon Bon is the cutest! But I have a weakness for canine demonstrators. It's frustrating to see how many of these cycle share bikes are sitting in their racks around the city, unused. Or people struggling to pay for them and trying to figure out the system. I think the troubles are greater than just the helmet laws. Promotion and ease of payment and spontaneous use need to be considered too perhaps? I'm so sad I didn't know you were visiting Australia! I hope the stupid law on cycle helmets is soon repealed in Australia, to send a signal to the world that cycling is in fact safe. And that Australians are as stupid as they currently seem. Thinking about the seasons, almost everyone is in gloves and/or coats. Might it be early spring there? I totally echo Saskia's comments - appearing on CCC, almost being arrested, being on Channel 7 & 9 and ABC news in Australia, and meeting some of my online friends in the flesh, was so worth the trip from New Zealand. Not to mention meeting THE Mikael Colville-Andersen!! Oh I didn't know that you were in Melbourne. I hope you liked it. The new scheme is great but you actually don't see to many people using these bikes and you don't see to many people in normal clothes riding their bikes. And I can't tell you how many people told me not to ride my bike while pregnant- to dangerous. So Australians definitely have in their minds that cycling is dangerous and a sport not a method of transport around a city. @About - I am pregnant and still riding around in my normal clothes as per usual. Just wondering whether you cycled all the way up to delivery or stopped? My obsterician suggested I stop at 20 weeks but I thought I'd like to continue cycling as long as I feel up to it and safe. Great photos. Love Bon bon. My staffie Boef enjoys sitting in my bike basket too! Shame about the weather the week you were here or you'd have enjoyed seeing a lot more people out on their bikes. @Joyce- I cycled up to 42 weeks pregnant, yes, he was 2 weeks overdue. If you have a bike where you sit upright then it is quite comfortable and a hell of a lot easier than walking! 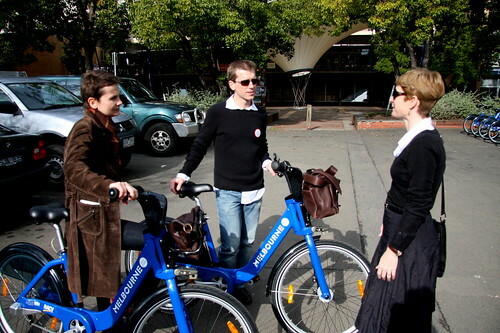 @About - Where I live in melbourne most people wear normal clothes while cycling. I think it varies a lot from suburb to suburb. hey guys, let's not forget that people may ride the bike for more than 20K. My office mate rides in from a suburb 30+ Km away. Honestly I'm glad it takes a shower and he changes his clothes. In some areas is also hilly, which means u may be smelly if u show up at the office without a change. Copenhagen is so flat and coolish that is perfect, I can't say the same here. Different city. I wonder how many people in Copenhagen use the bike to ride in 20 or 30+Km in normal clothes...so Melbourne is not as bad. But I fully agree the helmet is a pain, and the blue bikes will never pick up because of that, unfortunately. I ride my bike 22km to work and I have plenty of hills to deal with here in Brisbane. I just don't go so fast and I can wear my normal clothes and not be a sweaty mess on arrival. Not everything has to be about speed & 'personal bests'. My ride takes me 50 minutes. I I do this even in summer - and it is hotter & more humid than Melbourne. These are all just excuses. 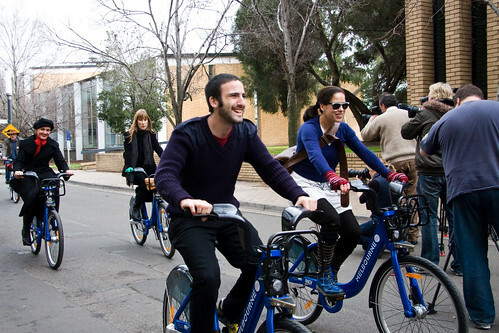 The bike share scheme has huge potential to increase cycling in Australia, i.e. getting people who otherwise wouldn't cycle to experience the joy and convenience of getting on a bike, however the helmet laws prevent the spontaneous use of these schemes. It's horrible to admit but sometimes the thought of ruining my hairdo or not being able to wear a hat makes me choose public transport over pedal-power (I can't risk going against the law as I'm a teacher). It sounds terribly vain but I'm not a sporty person and hate wearing sport equipment! Mikael can you come visit Sydney too? Pretty please! I love cycling because there is nothing better than to go outside and ride. It's a beautiful sport.The more you ride, the better you feel. And you don't have to deal with anyone if you don't have to.And I'm talking about riding, not racing. The racing culture has it's own pitfalls and my impression of it is it takes the fun out of the sport. When I saw today's post (8/8/2010) I thought you had finally got past the fact that Melbourne has both a strong racing tradition, going back as far as even Sir Hubert Opperman's success in The Tour, and a good sense of the bicycle as a commuter vehicle. And then I see you are purveying your opinons on helmets in the country. I've seen guys hit by cars (not pretty) and I've come off my fair share of times. Australia at least has the balls to say "this is in the community's best interests" to at least mitigate the risk. Perhaps you would also like to reflect on the Quit Campaign - actively encouraging australians to quit smoking. Or do you have a durrie every now and then?